Ronnie Hawkins was born into a musical family. His uncles and aunts performed at dances held on the family property in Huntsville. He showed musical talent at a very early age and was performing with bands in high school. In the early 50's he began performing around the Fayetteville, Arkansas area. After meeting Jimmy Ray Paulman he moved to Helena Arkansas in 1957 where he and Paulman planned on forming a band. This band consisted of Jimmy Ray "Luke" Paulman, Ed "Bubba" Burkes, Willard Jones, Levon Helm, and Ronnie Hawkins. Rehersals often took place in Burks grandmother's living room and sometimes in the empty KFFA studio. Soon they were playing the Delta Supper Club in West Helena and from there they expanded their gigs throughout Northeast Arkansas and Southeast Missouri. The steadily increasing popularity of the group guaranteed a packed house whereever they were playing. In 1958 Ronnie decided to try his luck in Canada. Rock and Roll was almost unheard of at this time and Ronnie Hawkins is often referred to as the father of Canadian Rock and Roll. Here he formed the band Ronnie Hawkins and The Hawks and the legend of "The Hawk" was born. 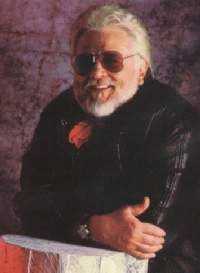 Ronnie Hawkins has influenced so many performers and legends that the list seems almost endless. Among those who have given tribute to The Hawk are: Levon Helm, Robbie Robertson, Kris Kristofferson, John Lennon, Mark Sallings, Richard Danko, Jeff Healey, Bev D'Angelo and many others. This Chapter was excerpted from the forth coming book "Before The Hawk Flew" by Bobbie Winifred Law. Bobbie Law is Ronnie Hawkin's sister. This particular chapter deals with the geneology of the Hawkins family and will be of interest to music buffs, and "Hawk" fans in particular but cultural and geneological students will also find it particularly useful for their research as well. "Copyright, 1997, Bobbie Winifred Law. All rights expressly reserved. No duplication of this material may be made without the author's express consent. For any additional information regarding 'Before the Hawk Flew', please call Zebulon Law at (714)553-1991." Heading south, just before you cross the bridge over a small creek where state roads 23 and 16 come together near Saint Paul, Arkansas, in Madison County, you will see a road sign that reads "Hawkins Hollow Creek" Everybody around there knows the correct pronunciation is Hawkins Holler Creek. It identifies the small creek that runs through the heart of a fertile valley in Northwest Arkansas where I grew up with my brother, Ronald "The Hawk" Hawkins. I'll never really know what prompted my brother to become a rock and roll singer, It probably had something to do with the musical heritage of our family. That part of the South is known for its traditions, and on the Hawkins Holler's traditions was music. The first Hawkins who came to the Holler was Great-grandfather Edward in late 1872 or early 1873. He brought his new bride, 16 year old Emily Bowles (daughter of James Daniel Bowles and Lydia Williams Bowles born January 19, 1856, in Owsley County, Kentucky,) to the 160 acre homestead which was located about a mile and a quarter off the main road, and it was there they set up housekeeping. Emily was not our great-grandmother. Our great-grandmother was Edward's first wife, Missouri c> Buice, born in 1843 in South Carolina. She and Great-grandfather met and later married in St. Clair County, alabama, on the 5th of September, 1861. Edward served for a year for te Confederacy in Company E of the Alabama Partisan Rangers. He was anxious to make a new home for his young wife and two small children, so as soon as the war ended, preparations were made. The wagon was loaded and goodbyes were said to many relatives who would never see them again. The destination was Arkansas, this was sometime in 1866, probably early spring. I have heard many stories about the death of Great-grandmother Missouri. She died somewhere along the way from Alabama to Arkansas. I don't know the disease that killed her. No one knows for sure. They called it a "fever". A coffin was constructed from the tool box on the back of the wagon and she was buried by the roadside in an unmarked grave. It was not unusual for traveling people who died to be buried by the roadside. They were still doing it in John Steinbeck's The Grapes of Wrath. Edward and his two children, young Billy, age four, and his sister Louiza, almost two, traveled on. Back in those days, there was no such thing as a day care center. There was such a thing as employing a hired girl if one were lucky enough to find one, but a young widower could not do this. It wouldn't be "fitten" so great-grandfather had to "board out" the two small children with a family named Mars while he worked on his first 160 acre homestead in Arkansas. The July 14, 1870, census for Valley township, Madison County, Arkansas, post office Saint Paul, p. 448B lists Matthew Mars, age 47, carpenter and farmer, Elizabeth (Williams) Mars, 48, keeping house, William Mars 22, Mary J Mars, 19,, James Mars, 18; David Mars, 16, William Hawkins, 7, (he turned 7 on July 4) born in Alabama, and Louisa Hawkins, age 4 born in Alabama. I have heard the children also stayed with a family named Welton later on. It could be that Elizabeth Mars was widowed and later married a Welton. The Welton family lived on the farm hear the "Y" which was later occupied by Joe Marks and his wife, Dean. Dean was related to the Weltons. The name "Marrs" is spelled three different ways: Marrs, Mars, and Myers. It is all the same name. Apparently , the census takers could not spell very well. The first homestead was located a few miles southwest of Saint Paul, Arkansas near Scully--the first name of old Saint Paul. Hawkins Holler was Edward's second homestead. Edward moved to the second homestead with Emily. When they moved, 10 (almost 11) year old billy Hawkins came too, to help his father and his new stepmother. HIs sister Louiza stayed with the Mars family. In the 1880 census for Hilburn Township, Madison County, p. 560B, Louiza Hawkins, age 14, is listed as a boarder with the family of David S. Mars. This is Matthew's son. Life in Hawkins Holler was hard those first years. The work day began before daylight and lasted until it was too dark to work. The only way to make any cash money was to sell timber or perhaps a farm animal, but most of the animals were work animals or food animals. Crops were planted in the spring and harvested in the summer and fall. HOgs were butchered. Hams were cured and hung in the smoke house. Corn was taken to the mill, and food that couldn't be canned, dried, or buried to dig up later in winter was given to the pigs to fatten them. School was not high on the list of priorities, but Emily helped billy Hawkins learn to read and write. I suspect the nearest school was at Saint Paul over three miles away. There was a school a little closer in our father's day. It was the Riverside School between Hawkins Holler and Dutton. Great grandfather Edward and emily had five children: Aunt Martha Ellen, born March, 1874: Uncle Henry Harvey, born August 30, 1875: Aunt Lydia Alice "Allie", born January 14, 1878; Aunt Elizabeth, born March 1880; and Uncle James Daniel "Jim." On the night of Uncle Jim's birth, March 12, 1882, Emily died. Great grandfather sent three men in three directions on horseback to try to find a doctor, but they couldn't fine one, and it was to late anyway. So once again Great-grandfather buried his young wife. She was only 26. Her grave is on the homestead, but no one knows where. Great-grandfather was left again--this time with five children. The oldest girl, Martha Ellen was abut age nine. She had to do the housework, cooking , washing, and taking care of the infant as well as the other three children. After the death of Emily, Great-grandfather Edward never remarried. In one month, he would be 43. Our grandfather Billy was now a young man of almost 20 and the census lists him as a farm laborer. He would soon acquire the adjoining acres (probably a tract of 160 acres) and dig a well and build a frame house. The creek ran in front of the house and the barn was across the creek and up on a hill. He also built a smoke house behind the house and cleared a garden spot. Back then I guess you could marry for love, but I expect that most unions were for practical reason. Miss So and So was available, and she was a good worker. So at age 22 1/2 or 23, Grandfather Billy chose a bride. Her name was Anna Wood, born August 18, 1876, in Tennessee and the daughter of Solomon Wood and Sarah C. Shewbird, of Cherokee descent, and she was a good friend of his sister Louiza. In fact, Louiza was "courting" Anna's brother Christopher (also known as Tony) Wood. The two couples married about the same time in 1885 Anna was 18. Louiza was 20. Billy and Anna lived in Hawkins Holler at the homestead. We later called this home the old home place. It was about a quarter of a mile farther on in the Holler. In the second year of the marriage, a daughter Dora Emaline was born October 2, 1886. Before Dora reached the age of two, Anna died. I guess the reader is thinking at this point that anyone who married a Hawkins was not long for this world, but remember this is Madison County, Arkansas, in the last quarter of the 1800's. If you got sick and couldn't recover by yourself, chances are you died. Most of the doctors then had a book of "treatments" They looked in the book for the suggested medicine for whatever symptons the patient had. Grandfather Billy's full name was William Edward Augustus Hawkins" He was born july 4, 1862 in Alabama. William and Edward were Hawkins names, and Augustus was a Buice name. I have traced the Hawkins family to the late 1700's when an Edward Hawkins was listed in Cherokee lands in what would become Hall County, Georgia. With the help of Burke's Peerage, the famous ancestry resource located in London, England, I have concluded that the Edward Hawkins there was the father of Nathaniel Hawkins, whom I know for certain was Great-grandfather Edward's father. Great great grandfather Nathaniel was married to Charlotte Cox in Fayette County, Georgia, on September 23, 1827, and our Great-grandfather Edward was born in Georiga April 27, 1839 but later moved to Alabama. I have been trying to connect our Hawkins ancestors to old William Hawkins, who was the keeper of the great galley for King Henry VIII and who was the father of Sir John Hawkins the great sea dog from Plymouth, england. The Hawkins family is listed in the 14th Century in Kent. LIttle did they know that in a few hundred years another Hawkins would be making history. Billy Hawkins, now 26, needed a new wife and stepmother for his daughter Dora. It was the luckiest day of his life when he met Rachel Witt from Ball Creek, then 16. Rachel was the daughter of Edmond and Eliza Clarkston Witt, and she was born October 9, 1873, in Harlan County, Kentucky. The stories go that the Wood family went to the Witt family and begged them not to let Rachel marry Billy. They said she would be dead in two years. The Woods always blamed Billy for Anna's death. Anna was not a strong girl and never fully recovered from the birth of Dora. She had to go to work in the fields long before she was able. Apparently, great-grandfather and Great-grandmother Witt said, "It's up to you, Rachel" and Rachel said yes. She came to the old home place when she was 16 years old. I have always told Ronald that if we have any brains, they probably came from Grandfather Cornett, but if we have any "gumption" it came from Grandmother Rachel. Our Great-grandmother Rachel was on of the most remarkable women I have ever known. When she came to Hawkins Holler not only did she take over care of baby Dora and the house, but she worked in the fields, planted large gardens, preserved food, and she began her career as a midwife. during her lifetime, she delivered more than 450 babies. The women had only her skills, her strength, and her spirit to see them through. She began having her own babies about every two years. Our father, Jasper, was number six, and he was born July 4, 1902, when Grandmother Rachel was 30. If you went to Hawkins Holler today, you would wonder how on earth anybody ever found the place. But it was one of the social hubs of the county. It had a big reputation for two things: hospitality and music. When a wagon came through on the way to Ball Creek, no matter what time of the day or night or time of year, they knew they would get a meal, they knew the horses would be fed and water, they knew they could rest on a shuck bed for the night, and they new Aunt Rachel (as she was called) would pack food and water to take with them. Hawkins Holler would soon be rockin'. From the time the Hawkins children could walk, they could sing and play an instrument or rather several instruments. Of course, they never had a music lesson. It was all natural. The term was they played by ear. They played organ, fiddle, banjo, guitar, accordion, mandolin, and bass. Our father's youngest brother, Delmar, (father of Dale Hawkins) was the greatest bass player I've ever heard. He was known as Skipper Hawkins and could have had a fabulous career, but he had the disease of alcoholism and was consumed by it. Hawkins Holler was the scene of music and dancing every Saturday night except in the dead of winter. People would come from miles around bringing a covered dish to enjoy an early evening of supper "on the ground" as they called it. the spread was actually on the porch, we there permitting. A little after dark, the music would begin. Grandmother Rachel had already cleared the beds out of the front room, and dancing, both square and round, shook the rafters. Grandmother did the calling, and brothers Henry and Eddie and sisters Mary and Pearl played. they sometimes had a "guest artist" or two on the fiddle. When brother Delmar got big enough, he joined in. Our father never did play an instrument. when he was two, he and his brother Henry and a fever that almost killed them. It was probably rhumatic fever. Anyway, he said he never was able to do the practice on an instrument. The Hawkins music became well known throughout the area. Brother Henry and brother Delmar went "professional" as soon as they were big enough. They were known as The Hawkins Brothers Band. Both during and after an evening of music, Grandfather Billy kept busy bringing out the "recipe". You see, he dabbled in moonshine. The Revenue Boys were pretty clever, but Grandfather Billy knew places that nobody could find. I don't think he ever made mooonshine to sell--he made it to drink, and he probably did some bartering with it. He had a Mephistilian sense of humor. He thought it was the funniest thing on earth to give his boys a "snoot" of moonshine and watch them reel around. The only books in Hawkins Holler were the Bible and an occasional mail order catalog. There might have been an almanac. I don't ever remember seeing any books there, but the children did manage to go a few months to the Riverside School and learned to read and write. Uncle Delmar went to the eight grade I've been told. Life revolved around the farm. The "men folks" worked in the timber and the field. The women folks in the house, the garden, washing clothes, ironing, and making quilts and shuck beds. I have never figured out how our two grandmothers did all that work and managed to make enough quilts to give each child ten quilts as a wedding present. Boys grew up, even in Hawkins Holler, and thoughts turned to the birds and the bees. Enter the Cornett family of Dutton, Arkansas, in Madison County. The time is early 1920. The Cornetts are descendants of King Canute I of England, Sweden, and Norway. Seven Canute brothers came to Grayson County, Virginia, in 1740 and later changed their name to Cornett. Our branch of the family is from John Cornett II (1828-1904), grandson of William Cornett (1761-1836), a Revolutionary war soldier. Our grandfather, Robert E. Lee Cornett, was the son of John Cornett II and Nancy Combs and was born in Perry County, Kentucky, on July 23, 1867. He and his family moved to Dutton, Arkansas in Madison County in 1872 where me met and later married our grandmother, Salona Cordelia Odom, daughter of Basil Osborn Odom and his wife Jamima Small, on October 14, 1893, when she was 16, and he was 26. Grandfather owned a small General Mercantile Store and the Post Office. Our mother, Flora, was born in Dutton on September 7, 1903. When Mother was ten our grandparents moved to a homestead about three miles from Dutton not far from the Riverside School. They had a log house on a creek bank. This was White River, Hawkins Holler Creek flowed into White River a mile away. My mother never did tell me, but I think she met our father at the Riverside School. She went to school there until she was 14. Then Grandfather sold his General Mercantile Store at Dutton and bought another General Store at Saint Paul three miles away. The eight grade was as "high as you could go" at Saint Paul, and Grandfather Cornett, who was a great advocate of education, wanted his girls to have at least one year of high school. Our mother and her sister Bessie went on to high school in Conway, Arkansas. Mother and Aunt Bessie took the teacher exam when they returned from school and both made a "first" teaching license. Mother began her teaching career in a one room school house at age 16. She had students older than she. At about this time my father would come to Saint Paul on Saturdays on the wagon with his father and brothers to sell timber and hang out. Grandmother Rachel had starched and ironed white shirts for everybody, and it was a day of relaxing and taking care of business. The business was to buy a few staples for the kitchen, getting horse shoes at the blacksmith shop, and for our father at least, to hang out in Silas Castile's Barber Shop. He said to himself, "I can do that," and in a few years, he could. Our mother, a teacher, and our father, a barber, were married by J. C. Haskins on the 25th of September 1927, on top of Tom Hill in Hawkins Holler. Only the Justice of the Peace and a cousin, Bert Wood, were there. They lived in Hawkins Holler for a while, and the following June our brother Royal Allen was born. Mother moved back to Saint Paul to have help with the baby. In August, when he was ten weeks old baby, Royal Allen died. Our Aunt Bessie was always looking after her sister Flora. In 1928, after the death of little Allen, Aunt Bessie and mother Flora pooled resources and came up with fifteen hundred dollars. They bought our father a barber shop in the fall of 1928 in Huntsville, the county seat, which was about 22 miles from Saint Paul. Daddy had two or three barbers working for him. Mother and Daddy had a rent house not too far from the square, and it was here that I was born July 21, 1929. Grandmother Rachel delivered me because Dr. Charles Beebe was on call at Ms Gaskell's house. James Gaskell has always said, "I'm your twin." During the first three years of my life, we lived in Huntsville and sometime during this time Daddy threw a big drunk, sold the barber shop, and had all the money spent before Mother Flora knew anything abut it. Our father was the most loving, kindest, and generous person I have ever know, but he could not handle responsibility. As Ronald and I were growing up, every time there was a crisis, daddy would throw a drunk until the crisis passed. We moved from Huntsville when I was four when Mother went to teach at Bidville, but we came back when I was five, and daddy began barbering again. He was a wonderful barber and had many customers who would wait for him. I remember clearly the night my brother Ronald was born (January 10, 1935). Dr. Beebe and Daddy were there. It was still dark and cold when Daddy came in and said "You have a baby brother." I think I was jealous of that baby from the very beginning. I knew he would get all the attention and I would have to take the leftovers. But as I recall, it wasn't so bad. I still got to go fox hunting, fishing, play with the pups, and sit on Daddy's lap, but I kept an eagle eye on the baby to see that he would not get more attention than I did. When Ronald was about a year old, daddy threw a big one and lost his job at the barber shop. The people loved him, but when he was drunk, it was a bit dangerous to be wielding a straight razor over a man's throat. Mother Flora decided that she had had it and asked Grandfather Cornett if she could come home. Grandfather told her, "Any child of mine is always welcome in this home." so for a few months, Mother, Ronald, and I lived with Papa and Mama Cornett. Daddy was always saying, "I'll never take another drink." And he really didn't want to take another drink, but of course he did. He got a job in Saint Paul, and we had a rent house near Wash Kendrick's Store. I remember a fight one night between Daddy and his brother Delmar. Mother and Daddy had found out that Uncle Delmar had stolen Mother's gold watch and her twenty-dollar gold piece. Uncle Delmar had sold both pieces in Huntsville. That's how we found out about it. This was the first time Daddy had seen Uncle Delmar since they learned about the theft. When the fight started, Mother Flora picked up Ronald (he must have been about one and a half) and we ran out the back door and went over to a neighbor's house. I believe her name was Nona Moody. The fight went on for a long time, but about 11:00, we went back and slipped in the door. There was blood everywhere. I saw Daddy first. He was on the floor, and he had his arm folded underneath him somehow, and it looked like the arm was gone. It really scared us to death. But then he moved a little bit and pulled the arm out, so we knew it was there. Shortly after this, mother bought a small three-room house on the hill up near the ball park. She paid $300 for three acres. I suspect Aunt Bessie gave her the money. When we first moved up on the hill, Ronald was about two or two and a half, and he had a terrible habit of eating dirt. When mother would put him outdoors to play, she would invariably find his toys abandoned and a circle of dirt around his mouth. I suppose this meant he was lacking something in his diet, but no one at that time knew about nutrition. Our Aunt Annabel Hawkins, who presently lives in Hawkins Holler, told me a funny story about Ronald. One day Daddy brought him up the holler, and he was playing on a swing in the living room. He couldn't talk very plain when he was little, and Aunt Anabel had a saying about the swing. It was go around, go around, twist, twist, twist, but when Ronald said it, it was dough woun, dough woun, tis, tis, tis. He didn't have a lisp, he just couldn't speak clearly until he was a little older. When Ronald was three and I was eight and a half, Mother went to teach on Boston Mountain. We boarded with Uncle Lee and Aunt Martha Witt. Uncle Lee was Grandmother Rachel's brother, and they had a two story house. This was the first two story house we had ever lived in. That old house was colder inside than out. There was only one fireplace for heat, so in the winter, Mother and I put Ronald in between us in the bed to keep him warm. Mother would heat an iron and wrap it in a piece of blanket and try to warm our feet in the bed. I would try to scare Ronald by telling him ghost stories, and when I tried to make my voice sound scary, he would laugh and clap his hands. So I gave up the ghost stories. We paid Uncle Lee and Aunt Martha $4 a month for room and board and for taking care of Ronald. I went to school with Mother and fell in love with Calvin Johnson, who was 15 and rode a horse and played guitar. He liked me even though I was only eight and a half. He came to Uncle Lee's and Aunt Martha's house one evening after school to play guitar for me. I knew that I would love him forever when he played "The Great Speckled Bird." this was the first time I ever noticed that Ronald was interested in music. He was three, and he was singing "The Great Speckled Bird with Calvin. Calvin said to Ronald, "You shore can carry a tune." Aunt Martha did a lot of canning -- peaches, apples, beans, peas, kraut, and all kinds o f butters and jellies and jams. Ronald and I both loved blackberry cobbler, so when she made blackberry jam, we always had a bonus cobbler. When I asked her who would eat all those jars of food, she said, "The Baptists." Mother explained that a lot of people came to Uncle Lee's and Aunt Martha's house every year and stayed for three days. Another bonus for Ronald and me was the "lick spoon." Every time a cake or pie was made, we got to clean the mixing bowl and lick the spoon. I was at last beginning to share a few perks with the "boy" as I called him. One day two men came by the Boston Schoolhouse. They were giving talks and showing photographs about crime. Since there was no cafe in the area, Mother told them Uncle Lee and Aunt Martha would be happy to have them for supper. In those days, hospitality was taken for granted. Someone in need of a meal, whatever the circumstances, was never turned away. After supper, the men showed us the photographs. They were of John Dillinger, Pretty Boy Floyd, and Bonnie and Clyde. They were photographs after they were riddled with bullets. We had nightmares about this. Mother told them the story about "the passenger". One day when Mother, Daddy, Ronald, and I were traveling in the '34 Ford from saint Paul toward Huntsville, we saw a tall woman walking. She had on a long dress down to the ankles and a big bonnet that covered her face. Daddy always stopped to give people a ride. The passenger sat in the back seat with me, and I noticed instantly what large hands this lady had. The passenger only rode about a mile and got out and began walking toward Pettigrew. We went on to Huntsville. we discovered later this was an escaped convict from a prison in Oklahoma. The men told Mother, "You were very very lucky that day." It was at Uncle Lee's and Aunt Martha's that Ronald was in the runaway car. I don't remember whose car it was. It was probably Uncle Lee's. Anyway Ronald got in and released the emergency brake, and we all had a good scare. fortunately, the car hit a sapling which kept it from rolling over a steep little hill and onto the road below. The other fond memory I have for Ronald and me was Uncle Lee's peanut patch. I heard Uncle Lee say one night, "I've got to get out there and pull those peanuts." The next day after school I said to Ronald, "Would you like some peanuts?" I could talk him into anything, so we slipped out to the peanut patch, and I fed him a whole batch. That night he had a terrible stomach ache, and Aunt Martha and Mother fretted the entire evening about what on earth could have caused a stomach ache. Of course, I had the look of a concerned angel.